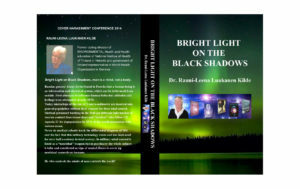 Re: the Book: “BRIGHT LIGHT ON BLACK SHADOWS” by the late Rauni KIlde, MD. (The book is already translated into Polish and available on eBay (ask DR.RAUNI KILDE) as JASNE SWIATLO W CIEMNOSCI TUNELU. MK (Mind Control) of TIs (Targeted Individuals). After the actions of “Stay Behind”* (Armies, such as Operation Gladio in Italy), badly hurt TIs – Targeted Individuals – are then controlled by NGOs (non-governmental organizations) which, in reality, are CBA – Community Based Agents. TIs try to get help, join organizations, attend conferences and join various email threads, fora, etc. There, they report to others about their suffering. This information is gathered and passed by NGOs to the oppressors- the “Stay Behind” Armies- who then can learn if their programs are adequate to their task. These NGOs are also spreading disinformation, false rumors, malicious lies to the public to discredit Targets and and those who try to help TIs. This happened to me as the publisher of Dr. Rauni Kilde’s book. All bookstores, couriers, and other people refused to sell or service the book. Amazon.com (in reality a CBA), since the beginning of February 1, 2016, is sabotaging and blocking the sale of this book; and on websites other than Amazon.com, the buyer is getting disinformation that there are no books in stock, when, in fact, I still deliver to anybody around the world. How to survive attacks of oppressors. There is no other real source of reliable and complete information than the book of Dr. Rauni Kilde. In accordance to two following statements the only way to protect yourself against the military secret technology being used is the knowledge about it and that our human energy is stronger than any other that is artificially created by our oppressors. … “MKULTRA was approved by the DCI [Director of Central Intelligence] on April 13, 1953 along the lines proposed by ADDP [Associate Deputy Director for Plans] Richard Helms. … The late 1940s and early 1950s were marked by concern over the threat posed by the activities of the Soviet Union, the People’s Republic of China, and other Communist bloc countries. United States’ concern over the use of chemical and biological agents by these powers was acute. The belief that hostile powers had used chemical and biological agents in interrogations, brainwashing, and in attacks designed to harass, disable, or kill Allied personnel created considerable pressure for a ‘defensive’ program to investigate chemical and biological agents so that the intelligence community could understand the mechanisms by which these substances worked and how their effects could be defeated. Statement 2. Dr. Rauni KIlde on her last conference November 20, 2014 in Brussels. The book is the manual and surviving kit for people in the XXI century. It teaches you how to read media, save you from visiting doctors’ offices, helps you to avoid killer–vaccines, and protects you against most of military’s secret technologies. This monster is not stopping it’s activities. Right now, since 2014, “Stay Behind” has introduced its technologies in Eastern Europe in Poland under the authority of the Ministry of Education. Since then, hundreds of victims in the civilian population in Poland have become TIs. Most of these are single young woman. I personally know two persons who are being attacked by the system in Poland. One of them complained to the Prosecutor. The Prosecutor, acting as a CBA (Community-Based Agent), filed the case in the court charging her for harassment of the prosecutor’s office with the suggestion to eliminate her from public life and put her in a mental hospital. You can buy the book, “BRIGHT LIGHT ON BLACK SHADOWS,” from Amazon.ca – BUT NOT FROM OTHER SITES. The best option, and a little bit cheaper (I pay shipment – ca $20.00 CAD), is to buy the book directly from the Publisher: Bohdan Szewczyk, 14 Arletta Street, Georgetown, L7G 3J3, Ontario, Canada, 905-873-0961. To keep your privacy, you can give me a different address than yours where I can send the book.